It's only the weather that's scalding in Las Vegas these days, as Sin City has seen employment and property values fall about as sharply as any major metropolis. Among metro areas with populations over 1 million, Las Vegas posted the nation's highest jobless rate in June at 14.5 percent. 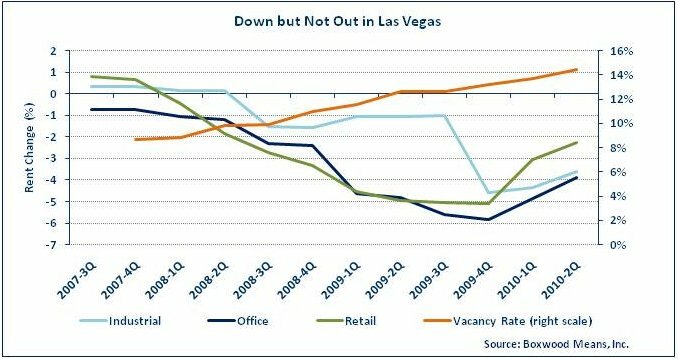 And demand for labor and real estate do indeed correlate: to wit, local data supplier Applied Analysis reports that the Las Vegas Valley is mired with some 30 million square feet of vacant commercial and industrial space, along with a 35,000-home residential surplus. But amid still-slumping commercial real estate sales and lease transactions, Vegas dealmakers are now seeing some savvy small-balance investors jumping into the void in anticipation of stronger user demand ahead. Just ask broker Brian Riffel, who has managed to sell some of the area's abundant vacant properties - and sees both investor and user demand starting to rebound. "Although unemployment is still high here, there are a lot of strong opportunities" to acquire assets at attractive pricing, stresses Riffel, a senior vice president with Colliers International. "And we're now seeing more users come to the table in addition to investors, which is an encouraging sign," Riffel adds. Predictably some cash-rich small-balance players are looking to nab occupancy-challenged commercial properties on the cheap - and accommodate employers as they start to grow once again. "I'd say more than 90 percent of the [small-balance] deals we're seeing here today are all-cash," Riffel notes. For instance, veteran local entrepreneur Jerry Dean just jumped on an opportunity to purchase a modern 13,362-square-foot industrial complex - which last sold for $3 million in 2008 - for less than $1 million. Riffel had initially sold the same two buildings, within Post Business Park in the city's southwest quadrant, to an auto-body operator on the developer's behalf. But business dried up and the former owner ultimately relinquished title to lender Zions Bank. With the listing from Zions, Riffel got the best price possible, amid surprisingly active bidding, from Dean - who brought in a sign shop as a tenant. Major national operator Panattoni Development Co. just pulled off a similar strategy, purchasing a vacant 19,786-square-foot REO and adjacent acreage, then flipping to user Yes! Air Conditioning & Plumbing. The new owner paid $1.8 million for the property off the Las Vegas Beltway at Buffalo Drive, and is planning to develop a parking facility for 100 service vehicles. Of course as Riffel and others are quick to point out, what will really bring users and investors back is better attendance at gambling tables. But even as low hotel rates and other incentives are starting to boost the visitor count, gambling revenue in Clark County in April was down 6.1 percent (to about $690 million) compared to the already-depressed year-earlier figure. Moreover, in the general office market vacancies surpassed the 25 percent mark during the second quarter, with foreclosures still rampant and effective rents still falling, CB Richard Ellis reports. It marked the 15th consecutive quarterly decline in the market's occupancy rate. Local small-cap office rents declined a head-turning 18.8 percent between mid-2009 and mid-2010, to an average now below $13.50 per square foot annually, Boxwood Means reports. Retail rents are likewise down sharply - 14.6 percent from mid-'09 to mid-'10 and averaging $14.30 a foot. And with upwards of 20,000 homes listed for sale locally, it's no surprise that apartment landlords are having to woo tenants with lengthy free rent periods and other incentives. Accordingly, average apartment rents are off more than $100 from year-earlier levels. But even amid concerns about additional store closures, at least numerous retailers are looking to expand here while occupancy costs are down - presenting savvy small-balance buyers with potential opportunities. Among the chains reportedly looking to enter Southern Nevada or expand here in coming months are: Clear Wireless, B.J. 's restaurants, Raising Cane's, Carl's Jr., dd's Discounts, Savers, Hobby Lobby and 7-Eleven. That's the kind of activity that should continue to attract other businesses and investors back from outside the Silver State, says Riffel. "East Coast money had been taking a black eye view of Las Vegas, but now these investors are starting to recognize that the lowered values make it a great time to buy here."